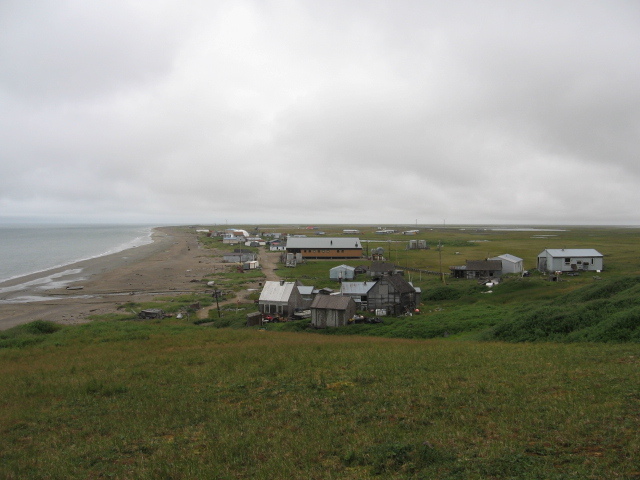 In Bush, Alaska, Cabin Fever, or being Shack Nasty as it’s sometimes called, can turn fatal. My husband and I lived for four years in Wales, Alaska, an Inupiaq village of 150 people strung along the Bering Strait. There, death in winter is not infrequent. Jack’s (not his real name) occurred a few years before we arrived. Jack had raped his little cousin. After serving time in prison, he returned to the still-outraged village. Winter days and nights in the tundra are long and dark, the temperatures arctic and the wind relentless, driving blinding snow from the polar ice pack, far beyond the frozen beach. Anyone caught out in such weather depends on the village lights to orient against becoming hopelessly turned around and out on the unforgiving ice. The village has a generator, but power outages are common during blizzards. Jack had been visiting one household and left, announcing he was going to walk a ways to visit another family. Minutes after he set out the village plunged into darkness. After an hour, the lights came back on, but Jack had vanished. The first rumors began. Talk was that the power outage had been timed for Jack’s walk alone on the beach. That spring, hunters found him out on the ice. Ravens had disfigured his face, and one arm raised high with, they reported, Jack’s hand pointing accusingly at the village. Was the outage caused by fierce weather, or the brooding hatred that can grow and be acted upon in the long, dark, Cabin Fevered nights of an Alaskan winter? This entry was tagged cabin fever, Winter. Bookmark the permalink.